When Decades Collide: Elvis the shop dog. If you didn't know already, Elvis is a 9 month old Australian Shepherd. He's not just my dog. He's my best friend. (Yes, I am one of those people who say "I love animals more than humans" and I am not kidding). Since I work from home, I spend every second of the day with him and I wouldn't trade it for the world. Its funny how he kind of just took over my instagram account (@whendecadescollide). No, I wasn't planting him in the photos. He just happened to be there at the perfect moment and now I think people follow me just to see him. 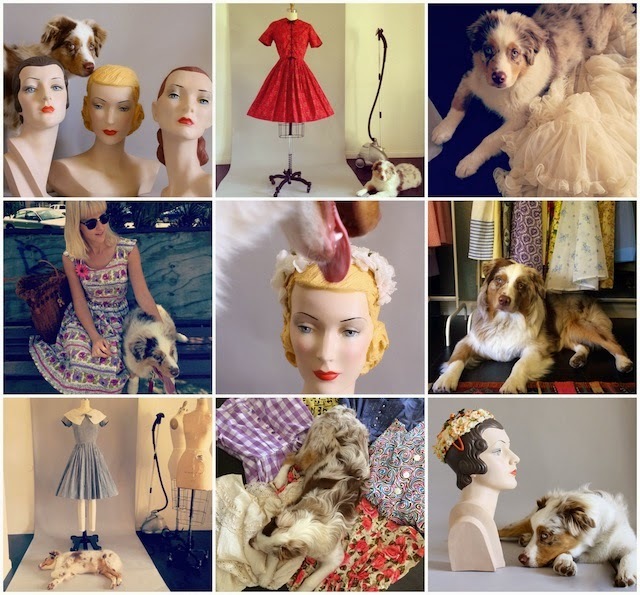 I don't blame them because I would do the same thing (my instagram feed consists of only vintage dresses and dogs). So he just kind of became the When Decades Collide shop dog and I love it.